TPi Duralumin Head gives greater color options for European wheels and vehicles with bolt use. 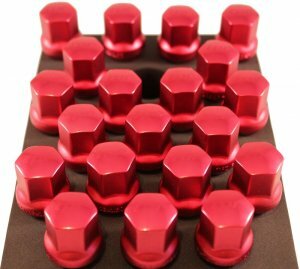 It is a stylish combination of Aluminum racing nut and lug bolt. The Aluminum nut top is made of material AL7075 heat-treated, soft-anodized with a polished top and sand-blasted sides for a high-end effect. Threads are Zinc(Trivalent Chromate), EU-approved. TPi special patented Press-In-Pin design fixes the nut firmly to the stud, to assure high endurance and safety.